1. Does Eurotunnel charge too much? The European Commission thinks so. The EC said both passengers and freight services are paying over the odds for using the track through the tunnel, which is operated by Eurotunnel. Eurotunnel is a private company owned by the investors who paid for and now run the Channel Tunnel. Eurotunnel said its charges are "transparent and not excessive." The EC has formally called on the British and French governments to look into the pricing structure and to comply with European Union rules against excessive track access charges. The European Commission said the high prices Eurotunnel charges the train companies get passed onto passengers. The EC also said that freight companies are put off using the Channel Tunnel because of the "excessive" charges, preferring to send their goods by road, which causes traffic congestion and pollution. The Commission claims 43% of the Channel Tunnel's capacity is currently unused. The European Commission also said that the regulator which oversees the tunnel, the Intergovernmental Commission (IGC) is weak and far from independent. The Commission said the IGC "does not have the power to adopt decisions on its own initiative without a complaint". The EC added that the IGC is not an independent body, because it is made up of representatives appointed by the UK and French governments. In a statement, the European Commission said: "Lack of independence of a rail regulator can lead to failure by the regulator to address complaints by operators in an independent manner or to adopt decisions to force compliance with EU rules and thus can lead to distortions of competition". Reacting to the assertions of the Commission, a UK Department for Transport spokesman said that "it is not accepted that the UK has failed to implement the relevant EU rules regarding the Channel Tunnel or that the IGC is not independent". My question is: charging too much relative to what? The piece does not get into the discussion of whether the company that operates the tunnel is abusing its monopoly power, or exactly what the European Commission means when they say that it's "charging too much." I would love to see a formal report on the subject, including an analysis of the externalities of Eurotunnel usage on continental railway traffic. 2. 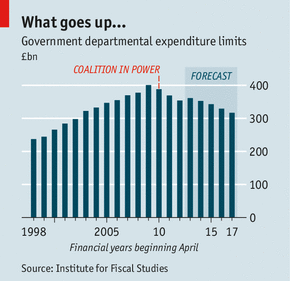 UK government spending: shrinking. By 2018 fixed departmental spending—which excludes variable payments such as social security—will have fallen by some £85 billion, or 21%, from its 2009 peak (see chart). Some 400,000 fewer people are now on the state’s payroll than were on it four years ago. By 2018 1m fewer will be. According to the Institute for Fiscal Studies, Britain will have undergone the fifth-largest cuts programme of 29 advanced economies. 3. Switzerland and the U.S. continue to negotiate an arrangement that would enable the U.S. to obtain information on tax evaders who stash assets in Swiss banks. FATCA (Foreign Account Tax Compliance Act) was passed in the Senate yesterday. The House will discuss the bill later this year. Under the Foreign Account Tax Compliance Act (FATCA), the US authorities will, in the future, get banking data of all American citizens (and other people subject to US tax law) who hold assets in Swiss banks. The law is to come into force at the beginning of 2014. Under FATCA, the Swiss government opted for a system of cooperation with the US which stops short of an automatic exchange of information, but allows Washington to request information on non-compliant individuals. Local Swiss banks, pension funds and social security schemes are exempt. Financial institutions refusing to provide the data risk being excluded from the US financial market. However, the Swiss parliament has rejected the deal, and thrown the ball back to the government's court to find an alternative deal, presumably one that would infringe less on Swiss sovereignty. It appears unlikely that the US would accept more years of negotiations to find another solution, while the Swiss government is expected to face legal challenges from bank employees and the Swiss data protection commissioner if it unilaterally allows banks to ignore secrecy laws and hand over information to the US. In 2010, the Federal Administrative Court ruled the handover of UBS client data to the US the previous year as illegal. A later and larger data transfer was only allowed after winning parliamentary approval. But this time around, parliament appears determined not to cave in to perceived US bullying – a stance that has some sympathy from Beckett Cantley. But for former Swiss ambassador Blickenstorfer, there is no room for sentiment in the cut and thrust world of international diplomacy. Larger countries have always thrown their weight around with less powerful counterparts, he said. Teig Lawrence is convinced that US undeclared money could still be stowed away in offshore bank accounts - including Switzerland - despite some 40,000 people owning up to the US tax authorities during amnesties. The majority of people who have employed his services to come clean have been those with smaller sized assets rather than multiple million dollar stashes. "Those people with greater resources generally feel that they have a greater ability to weather the storm," Lawrence told swissinfo.ch. "They are more likely to adopt a wait and see approach." And here's an article from the American side. Switzerland and the U.S. have been talking about this for years, but it seem's like this year's case involving Swiss bank Wegelin has put some momentum on the issue.